The release of information from the 2006 census allowed us to extend the analysis. Our first analysis used a built boundary from 1990 and intensification data from 1991 to 2001. What would be the result of extending the analysis by another five years? Figure 11 shows intensification rates for the 15-year period under study; we have divided the study period into the first 10 years and the last five years. The pink bar represents rates between 1991 and 2001, the blue bar represents rates between 2001 and 2006, and the purple bar is a cumulative rate for the entire 15-year period. In almost all cases, the rate dropped in the last five years of the 15-year period. This finding may indicate the filling up of intensification opportunities at the urban edge, making further intensification more difficult to achieve. 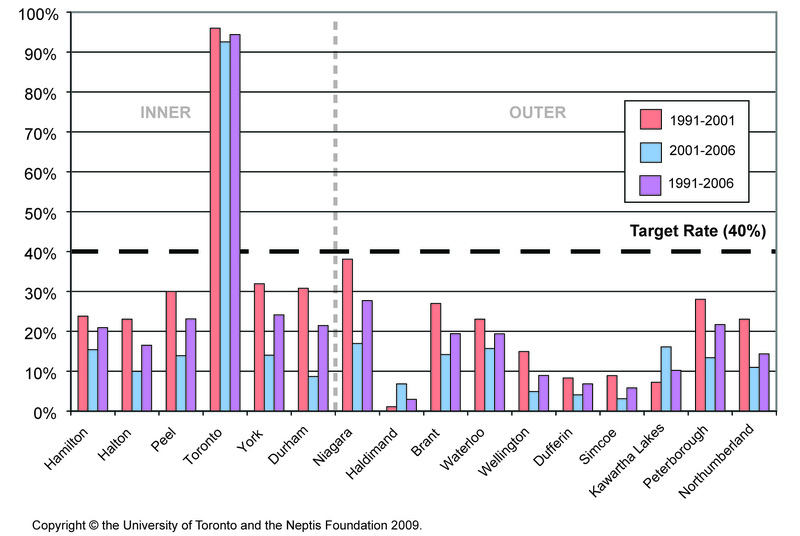 Figure 12 shows the spatial pattern of intensification for a mainly urbanized area of the Region of Peel, over the 15-year time period, again dividing the period into the first 10 years and the last five years. More interesting than the change in rate is the change in the spatial pattern of intensification. Between 2001 and 2006, there still is some edge activity, but much less than in the first 10 years of the study period, and more intensification is occurring in interior locations, such as Square One near the designated centre of Mississauga. Looking at how the rates change and where intensification is happening over time, it seems that it may be easier to achieve the target at the beginning of the period of measurement, but it may become more difficult as the "easy" edge opportunities diminish. If municipalities find themselves in this situation, they may pressure the Province to move the built boundary out--that is, to enlarge the land base over which intensification will be measured. As it stands now, the built boundary is supposed to remain static through the life of the plan. But what if the Province moved the boundary? What would happen to a municipality's rate? We conducted further research to model the effects of this change. Patterns of intensification: here, there, or everywhere?